For some time now, I have been an avid listener of guided meditations but only recently did I discover one of the oldest companies of this helpful wellness modality – Health Journeys. 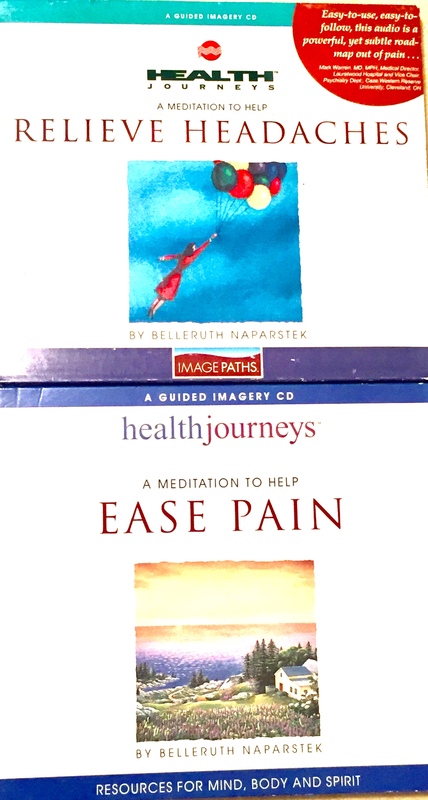 Because of my positive personal experiences, I feel compelled to highly recommend Belleruth Naparstek’s guided imagery CDs (also available in digital downloads on iTunes). Her offerings range from pain reduction to preparing for surgery, stress relief, alleviating tinnitus, increasing self-compassion, reducing depression, and so much more. Belleruth is a psychotherapist whose CDs have been used in over 3,000 hospitals and clinics for years. Guided imagery bypasses the conscious mind, and works on the subconscious to promote healing and well-being. Each CD/download includes a guided meditation with visualizations as well as affirmations – all accompanied by beautiful relaxing music. To maximize the healing benefits, it is recommended that one listens once or twice per day for several weeks. I’ve found listening before sleep is very effective. Of course, everyone is different and voice preferences are subjective. I enjoy the CDs that are personally narrated by Belleruth. My hope is that you too will benefit from her meditations and affirmations. Please check it out at www.healthjourneys.com or on iTunes – enjoy!